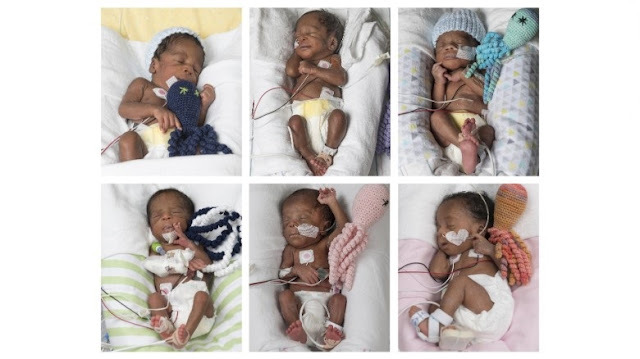 Adeboye and Ajibola Taiwo are the couples that has been blessed with six babies after having tried for 17 years. They gave birth to three girls and three boys, all in good condition, fragile and very healthy. Adeboye and wife welcomed their babies on the 11th of May at 8:26am through cesarean section at Virginia Commonwealth University Center in Richmond. On hearing the good news that were expecting six babies in November 2016, a 40-person teams started doing delivery drills to make sure everything goes very well with no complication on the faithful day. It was a great joy for the family when they had the news because they had waited for nearly two decade to conceive a child. Congrats to them. It's has been God who heard their cry.